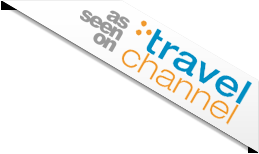 Welcome to BikeRoundOZ - As seen on the Travel Channel! 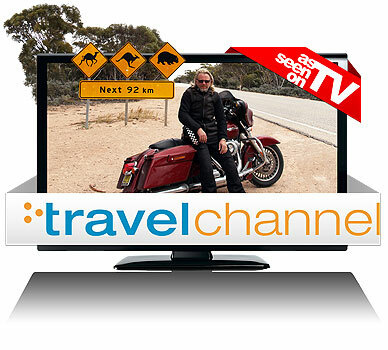 Bike Round OZ and the Travel Channel have teamed up to bring you the eighth edition of the popular series World's Greatest Motorcycle Rides. "Henry Cole meets the Aussies. Surely no good can come from this. For his epic journey across the south of the country, Henry boards his 'boudoir on wheels', better known as a Harley Davidson Street Glide, and attempts to ride from Sydney to Perth. The greatest risk to Henry's health is the wildlife, which have a habit of throwing themselves in front of vehicles after dusk; 'so, whatever you do, don't ride after dusk' is the frequent local advice. After two days' riding where Henry arrives at his location well after dusk, he is forced to reassess the vastness of this country and the schedule he is trying to keep to. Along the 6,000 kilometre ride, Henry takes time out of the saddle to visit the coolest chop shop in Oz, indulge in some astonishing stunt plane flying and take a helicopter tour over the Twelve Apostles. One of the greatest ever tests of Henry's skill as a motorcycle rider though comes across the Nullarbor Plain; which includes the longest straight road in the world, 200 kilometres of tarmac without a single bend. Despite all his experience Henry falls asleep on his bike, proving that the most challenging of roads can often be the, seemingly, most straightforward. Can Henry survive the Outback and, even more challenging than that, the Aussies' sense of humour?" More information about Henry's ride is coming soon!